At Maddington Physiotherapy Centre, we have an extensive on-site exercise rehabilitation gymnasium. Our gymnasium differs from your standard commercial gymnasium, as it is specifically set up for the treatment and rehabilitation of our patients. 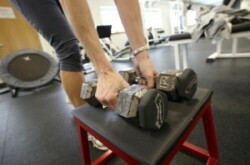 Classes offer resistant training combined with a cardiovascular workout. Can also help with muscle injuries. Run by qualified Physiotherapists and Exercise Physiologists. Private Health rebates apply.